We are passionate about introducing the best quality roast coffee and finest brewing machinery available to the East Midlands and East Anglia regions; Lincolnshire, Cambridgeshire, Norfolk, Northamptonshire, Rutland and select areas of Nottinghamshire, Leicestershire, South Yorkshire, Bedfordshire and Hertfordshire and Suffolk. Fabulous espresso doesn't need to be intimidating, you just need the right tools and quality materials to offer the best Italian inspired coffee to your customers. The difference between a Latte and a Cappuccino are well documented, but do you know some of the more unusual and specialised espresso drinks? Black Eye, Red Eye, Doppio, Flat White, Macchiato (Espresso Romano, ect. Check out the lastest information about Boston Coffee: New machines, new bean roasts and blends, what trade shows we are appearing at and other miscellaneous cafe and coffee related news. Edible cups, rare coffees and other eye-opening industry news can be found here. It was that one, last thing that the serious coffee-addict needed; on board espresso. 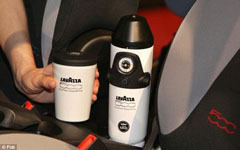 Italian brands Fiat and Lavazza have teamed up to finally plug a hole the in the market, ( that we didn't realise existed, but now think; How did we ever live without it?! ) For the person on-the-go with higher coffee standards than could be found in most garage forecourts and motorway rest-stops, this is the answer. Being released as an optional extra, the new Fiat 500L, which will be released later this year, will come with a coffee-maker next to the gear-stick. The Lavazza-branded kit even comes with a sugar container, 'pod dispenser', and a spoon. If you're more of a car fan than a coffee lover, then the vital stats are that the 500L comes in a three- and five-door option with a 1.6lt, 16 valve engine. Small, but quick. Like espresso itself. It might not be up to the rigours of professional foodservice, but we were awfully impressed wtih this fabulous new device, the MyPressi, a portable, hand held espresso 'machine'. "It all started with a simple mission: build the world's best handheld espresso machine. Forget the wires, the pumps, the electrical tethers to the wall. Funnily enough, there weren't any handled espresso machines at the time so innovation was the only option. Extreme innovation. A team of incredibly talented designers and engineers in California pulled it together. Powered by tiny bulbs of gas powered at 600 psi, the TWIST reaches the operational pressures of professional Italian espresso machines (9 bars, 145 psi) in absolute silence with the squeeze of a trigger." It's pretty cool for a party-trick, travelling or a gift for the person who has everything. Segafredo Zanetti is now the leading Espresso producer in Italy and throughout the world, with more than 70,000 clients and 50 million cups of espresso drunk each day is now available in the UK, being distributed by The Boston Coffee Company. "Its mission is to spread the taste, the culture and preparation method of the true Italian Espresso to the whole world. Translating this objective into action means offering a product of the utmost quality, quality that is guaranteed from the coffee plant to the cup, as only Segafredo Zanetti knows how.....A direct control on all the steps of the production cycle: Segafredo Zanetti is in fact the only company in the coffee industry that directly controls the entire coffee production process." With ethics in coffee sourcing such a priority in the coffee and cafe market, we have been searching for a long time for a partner that would fill this requirement. Ideally, they would not only be a responsible sourced bean, but also a trusted, recognisable brand that would be known for their philosophy, have an organic offering, but most importantly; have great tasting coffee with sophisticated flavour profiles and aroma in wholebean, ground and soluble instant. We also wanted something that 'ticked all the boxes' that would be suitable for those public bodies who would usually look for Fairtrade products. We're pleased to say that we have found this with our new offering; Cafédirect. On top of all that, it's very reasonably priced too. "At Cafédirect we do things differently. We build real and direct relationships with smallholder growers, because the big thing smallholders have is pride and passion and that’s what makes our award-winning range of hot beverages taste so good. In return for their quality crops, we pay growers what they deserve and over the past 20 years we have reinvested over 50% of our profits back to the growers to create a more sustainable future and ensure we provide our customers with top quality products every time..."